What does Snappd.it Code have in common with Professional Bowlers Association? Social Media Flyer via Snappd.it! We are so thrilled to have Professional Bowlers Association (PBA) using Snappd.it to create their next round of social media posters for their events! 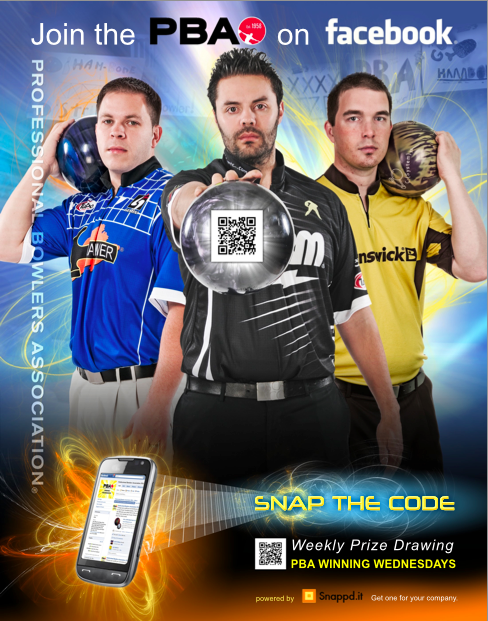 The posters look awesome, and will enable people to access all of PBA’s social media channels, promotions and PBA events information on their smartphone, simply by snapping the QR code. No typing necessary! About Snappd.it: Snappd.it helps boost your Facebook and Twitter followers and get reviews for your business from customers right in your store! You can get one for your business in 60 seconds. Every 60 seconds, we are getting more and more businesses creating their Snappd.it flyers and mobile sites, here are some stores so far: Brown Bag Cafe in Kirkland, Celebrity Cake Studio in Tacoma, Starbucks in Pike Place, Carolann Joy Salon in Redmond. When are you going to do one for yours? Don’t wait too long before the FREE limited time offer expires. This entry was posted in Announcements and tagged brown bag cafe, carolann joy salon, celebrity cake studio, local social media advice, professional bowlers association, qr code, snappd.it, social media tools, starbucks on February 16, 2011 by paperboy.